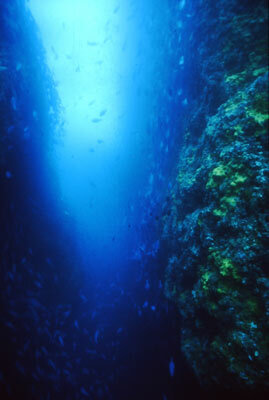 The above was my first experience of diving at Northern Arch back in 1992. 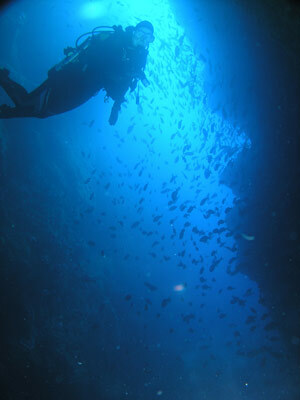 In March 2011 I again visited the Poor Knights and once again dived the premier dive site there, Northern Arch. 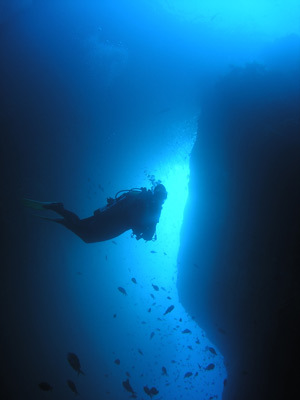 Only about three or four metres wide at the surface, Northern Arch drops away dramatically to over 45 metres where it is at least 20 metres wide. The bottom is mostly sand with a few rocks here and there. 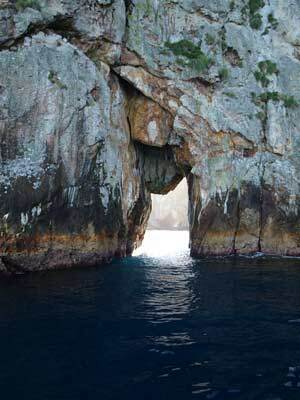 Northern Arch is, not surprising, located at the northern end of the western side of the northern island, Tawhiti Rahi. It is an archway that runs through a large ridge that runs east-west. Its GPS location is S35º 26' 54.8" E174º 43' 53.9" (using WGS84 as a datum). 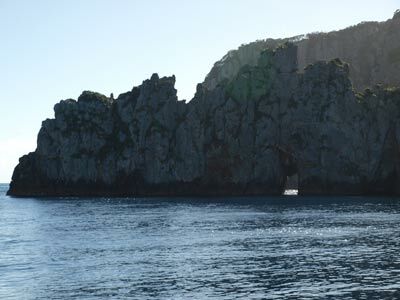 This will put you about 40 metres off to the south-east of the arch where there is some shallower water. If winds and seas were from the south-west, then you may be able to anchor on the other side of the ridge. 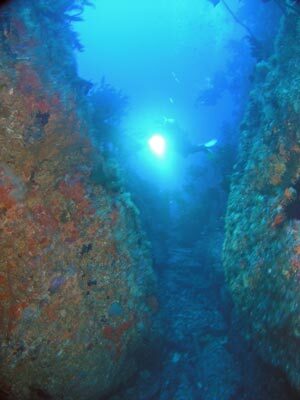 In fact, I have dived Northern Arch from that location and it is as easy as from this side. After anchoring, drop off the back of the boat and descend. You should be able to see the wall almost straight away. Once you see the wall, angle your direction of travel to the west till you are right on the wall. This wall is vertical and drops to over 40 metres. Follow the wall, gradually getting deeper as you approach the arch. Once you can see the start of the arch ahead, you need to be down at least at 25 metres and perhaps 30 plus metres to really get the best view of the arch and the fishlife. 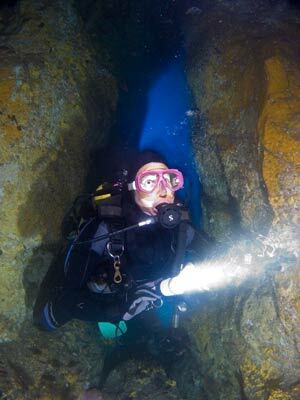 Make sure you do not go too deep as this will severely limit your bottom time. 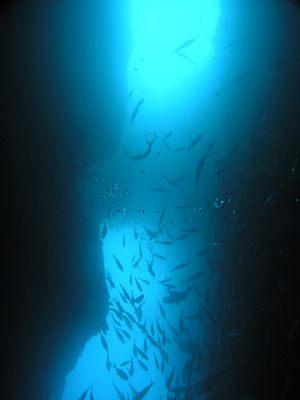 As you will soon see, the whole arch is filled with fish. 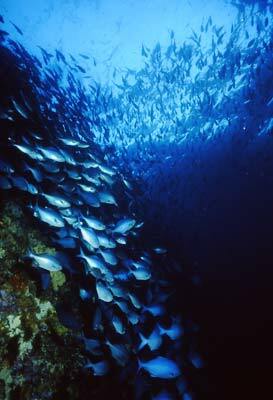 There will be huge kingfish and snapper swimming around, with many large stingrays circling in and out of the arch. The sides of the arch, especially the eastern side which has an overhanging wall, a full of thousands of pink and blue maomao. 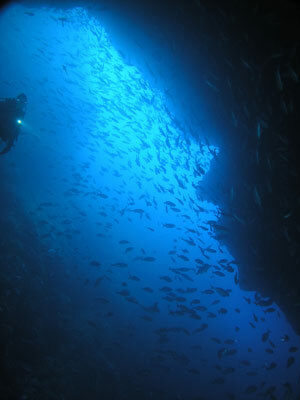 This is definitely the best dive site at the Poor Knights and one of the best dives in the world. Swim along the eastern wall to the north and exit the arch. There can often be a current from the north here, so sometimes you cannot do this at all or you may need to only go a short distance. 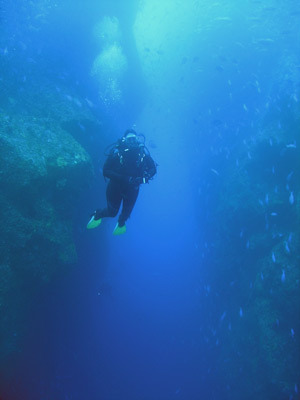 Do not go too far, as there is a lot more to see on this dive. Cross over to the western side of the arch and head back south. Follow this wall as it turns to the west. This wall is also vertical. On our 2011 trip some members of our group saw two large bronze whaler sharks cruising along near the bottom, about 15 metres below them. After going about 40 metres, turn around and head back to the east. You should start to ascend a bit as you go so you do not run out of bottom time. Once you are back at the arch, you can either swim across to the other side or go in a bit and then over to the eastern side. Continue swimming east along the wall. After about 10 metres you will see a large crack that runs at 45º to the north-east. 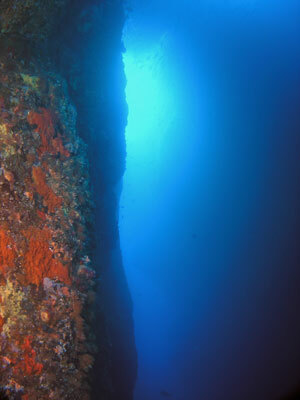 This can be explored for 10 metres or so, but I would not go further on a first dive as the bottom goes up a small cover at about five to eight metres (I think). There is more to see deeper so leave it for a second dive here. Another crack comes out of the cover about 20 metres on. By now, make sure you are at about 16 to 18 metres. You will soon see a cave off to your left. At first this does not seem too big (it is high but not very deep). However, look to your right and you will see another arm of the cave. This L-shaped cave hooks back to the left and is a bit bigger. 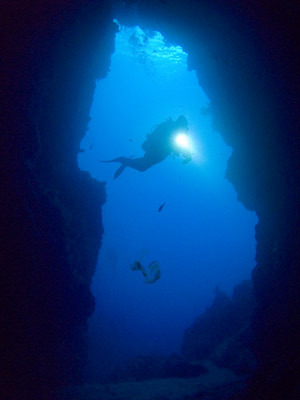 Once you are back out of the cave, spend the rest of your dive ascending gradually to five metres. 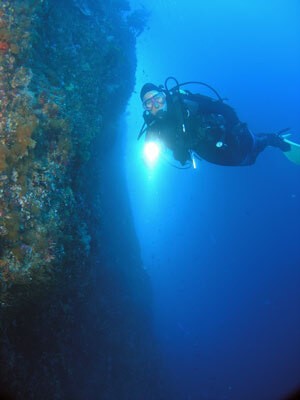 Spend this time and your safety stop on the wall, there is a lot to see. 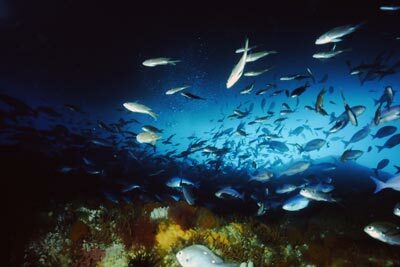 There is also very good fishlife off the wall, with more kingfish, koheru and two spot demoiselles all over the place. 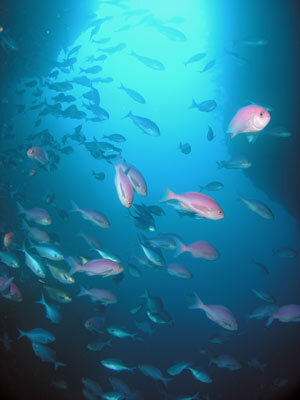 Visibility is normally very good, I have had 25 to 35 metres visibility on my three dives at Northern Arch. The water temperature is about 22ºC in March and 17º in April. 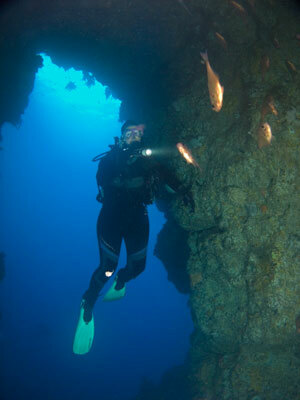 A brilliant dive, possibly the most exiting reef dive I have done in over 3,100 dives! The following photographs are from my 1992 trip to Poor Knights. 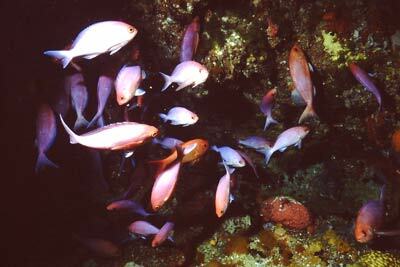 They were taken with a Nikonos IVA using Ektachrome slide film. Scanned January 2011 to digital.